The Nosh & Co. 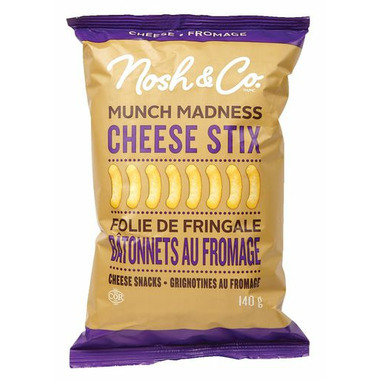 Munch Madness Cheese Stix are sure to satisfy any cravings! 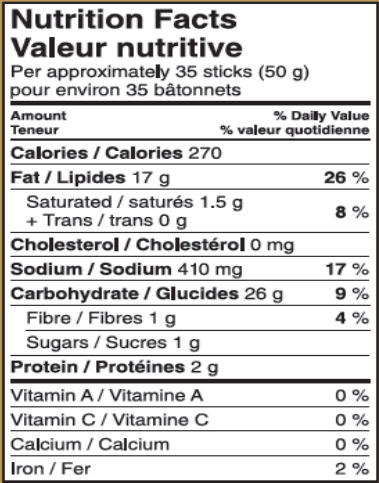 Ingredients: cornmeal, vegetable oil (canola and/or sunflower and/or corn), seasoning [maltodextrin, salt, monosodium glutamate, natural & artificial flavours (maltodextrin, non-fat dry milk, lactic acid, cheddar cheese, butter, natural and artificial flavours, yeast extract, disodium phosphate, medium chain triglycerides, silicon dioxide, modified corn starch), citric acid, silicon dioxide, artificial colour (contains tartrazine and sunset yellow FCF), soybean oil]. contains: milk. The best cheesies-type product I've ever had. They're so good and so fresh. At the Recall by my house they often sell out because they're so popular. Obviously not a health food. But such a treat once and a while. There's MSG as the 3rd ingredient!! That is insane to keep putting that in new snacks...not healthy at all!